The Kuril islands are a string of volcanically active peaks bordering the Northwest Pacific Ocean and enclosing the Sea of Okhotsk. Stretching from Northern Japan to the Kamchatka Peninsula, these small and remote islands occupy the transition from the temperate to subarctic zone and provide the most direct link between coastal East Asia and Western Beringia. While the southernmost and northernmost islands were connected to the mainland (Hokkaido and Kamchatka) at the height of the last Glaciation, the small central islands have remained unconnected throughout the Quaternary. The Northern and Central Kurils are ice bound in winter and differ little from the western Bering Sea or Aleutians in climate or ecology. By contrast the southernmost islands support dense stands of bamboo and forest cover. The combined forces of biogeographic isolation and ecotonal transition strongly affect island ecology. As a result, these islands serve as dynamic yardsticks for the biogeographic study of human, plant and animal dispersion and contraction into the maritime and subarctic zone. They are uniquely positioned to reveal information about the effects of climate change on human maritime adaptations. And they are ideally suited for investigating the sensitivity of terrestrial and maritime species to prehistoric human impacts, and by inference the sensitivity of exisiting species to the impacts of the modern world. And as the most direct connection between maritime East Asia and Beringia, they are uniquely situated to advance our understanding of the settlement history of the Beringian coastal zone. 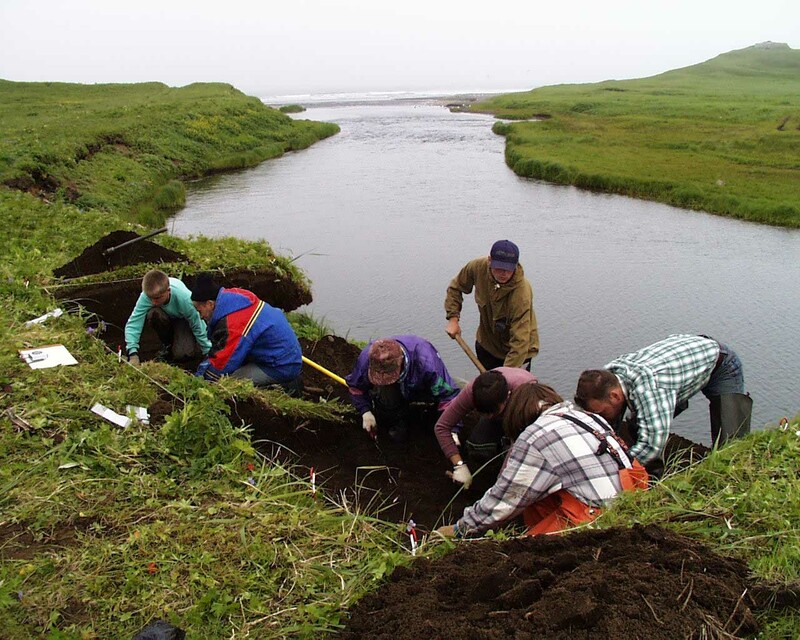 Archaeological survey in the Kuril Islands was first conceived after the 1996 International Kuril Island Project biological team discovered a possible Ainu site on the island of Onekotan. A preliminary survey of the islands was completed by UW archaeology student Tim Allen in 1998, and in the summer of 2000 archaeologists from the University of Washington and Harvard University joined scientists from Russia and Japan in an archaeological study of the Kuril Island Archipelago. This research was made possible due to the generous support of the National Science Foundation (NSF) and the University of Washington (Office of the Vice Provost for Research and College of Arts and Sciences). The purpose of this website is to serve as a resource for all IKIP researchers and for anyone interested in the archaeological, geological, and paleobotantical record of this exciting region of the world. In the upcoming months we will add new infomation as analyses are completed.